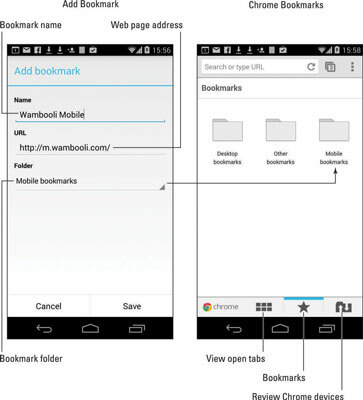 Bookmarks are those electronic breadcrumbs you can drop as you wander the web on your Android. Need to revisit a website? Just look up its bookmark. This advice assumes, of course, that you bother to create a bookmark when you first visit the site. The cinchy way to bookmark a page is to touch the Star icon when viewing the page. The Star icon may be found atop the screen, or you may find it on the Action Overflow menu. After touching that icon, you see the add bookmark screen, similar to what’s shown on the left. You might want to edit the Name (or Title) field to something shorter and more descriptive, especially if the web page’s title is long. Shorter names look better on the Bookmarks window. Touch the Save or OK button to add the bookmark. View bookmarks in Chrome by choosing the Bookmarks command from the Action Overflow menu. Bookmarks are organized by folder, on the right. 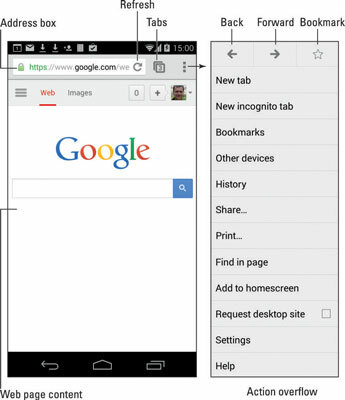 In other web browser apps, look for the command on the Action Overflow menu or for a Bookmarks icon on the app’s main screen. Remove a bookmark by long-pressing its entry in the Bookmarks list. Choose the Delete or Delete Bookmark command. Touch the OK button to confirm. The bookmark is gone. Bookmarked websites can also be placed on the Home screen: Long-press the bookmark thumbnail and choose the Add Shortcut command. You can add bookmarks to the Home screen also by using a widget.